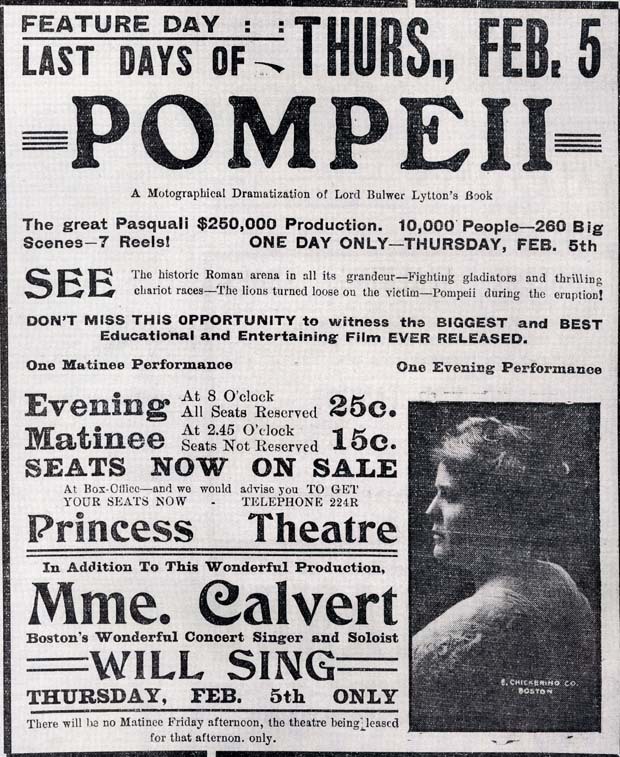 "More than 150 people were turned away from the 8 p.m. showing of 'The Last Days of Pompeii' the 'longest and best-ever' film presented at the Princess Theatre. All but the first two rows of seats on the floor of the 1000 seat theatre were taken during the afternoon showing. Many in the audience had never been in the theatre, and most had never seen anything but the 'ordinary run of motion pictures.' According to an article in the next day's paper, the audience had 'their eyes opened to the real greatness of the photo-play industry. Especially thrilling were the scenes showing the chariot races, the lion's den and, capping the climax of all, the realistic eruption of Vesuvius and the mad flight of the inhabitants.' The performance of Boston's Tremont Temple soloist Mme. Wilhelmina Wright Calvert was said to be 'superfluous'." - Text from calendar by Jayne M. D'Donofrio. “Princess Theatre, 1914,” NOBLE Digital Heritage, accessed April 22, 2019, https://digitalheritage.noblenet.org/noble/items/show/7058.